The Universal Robots UR10 robot has helped Swedish food company Orkla Foods streamline production and reduce repetitive and manual lifting for workers without the need for extensive safety installations. Among other products, the company prepares vanilla cream; however, before they invested in the UR10, the vanilla cream bags were packed manually into cartons. The company sought to find an automation solution that could be easy to manoeuvre in factory settings, safely work with people and operate well with other production machines. 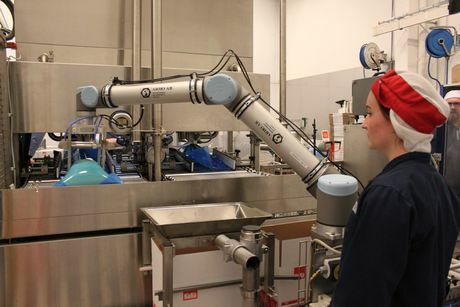 “An important requirement was that the robot had to work flawlessly so that we would not need supervision or extra support for it to work," said Johan Linné, plant manager, Orkla Foods Sweden. “It would also be a major advantage if it did not require safety guarding around it and could work safely alongside our employees." The UR10 robot helps the automated process by placing sealed bags in cartons. Weighing less than 30 kg, it has a payload of 10 kg and six rotating joints. It also has a reach of 1.3 m, designed to operate more effectively across a larger area. The robot works independently but is part of a network with a carton erector and a carton sealer, and is fed by a filling machine. “It is flexible, easy to implement, simple to program and can perform various tasks in a network with other machines," said Linné. “An important advantage is that the robot stops if you bump into it, meaning that it is safe and does not require any safety guarding around it, which makes it more integrated with the employees. “We have got a more economic and stable operation and we are now looking into whether there are other applications where we can use this type of robot." Linné said the payback time of the investment in the UR10 is about six months.